Melissa Simon, MD, the George H. Gardner Professor of Clinical Gynecology, has been appointed to the U.S. Preventive Services Task Force. 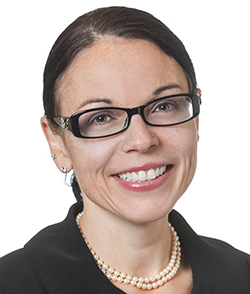 Melissa Simon, MD, the George H. Gardner Professor of Clinical Gynecology, has been appointed to a national task force that makes recommendations on clinical preventive services, including screenings, counseling and preventive medications on topics such as cancer and diabetes. The U.S. Preventive Services Task Force (USPSTF) is an independent, volunteer panel of 16 national experts in prevention and evidence-based medicine whose members come from many fields of preventive medicine and primary care, including internal medicine, family medicine, obstetrics and gynecology, pediatrics, behavioral health and nursing. The appointment is “an amazing, pie-in-the sky career goal,” said Simon, who also is the vice chair for clinical research in the Department of Obstetrics and Gynecology and a professor in the departments of Preventive Medicine and Medical Social Sciences. She began her four-year term with two other new members on January 1. The Task Force makes evidence-based recommendations on clinical preventive services for primary care clinicians and their patients. “It’s quite a huge honor to be able to represent primary care providers, especially in the area of women’s health — and specifically in the area of obstetrics and gynecology — while at the same time championing recommendations that meet the needs of diverse populations at a national level,” Simon said. Simon is also director of the Chicago Cancer Health Equity Collaborative, a National Cancer Institute-funded initiative to reduce cancer disparities in Chicago’s low-income neighborhoods. To learn more about Simon and all members of the Task Force, visit the USPSTF’s members page.